The coupe-SUV trend is proving to be contagious. It all started with the BMW X6 nearly a decade ago, a sportier alternative to the X5 featuring a coupe-style sloping roofline. Its success paved the way for the Mercedes GLE Coupe, and more recently the . 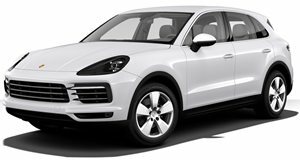 And now Porsche is joining the coupe-SUV bandwagon. Rumors suggested Porsche has been considering building a coupe version of the new to broaden the model’s lineup, but now it’s been given the green light according to . Porsche boss Oliver Blume told the publication the Cayenne coupe will arrive in the UK in Q4 2019 to rival the BMW X6, Mercedes GLE Coupe, and . Unsurprisingly, the coupe will be based on the more practical and will be built alongside the SUV at Porsche’s factory in Leipzig, Germany. According to , the Cayenne coupe will feature the same front-end styling as its SUV sibling but will have a more unique front bumper design to set it apart. It will also adopt a newly styled liftback-style tailgate, altered rear side windows and sleek new taillights that will give the Cayenne coupe a sporty profile similar to the second-generation Panamera. Unsurprisingly, a diesel engine isn’t being considered. Instead, the Cayenne coupe will be positioned as a performance model with a choice of gasoline engine options including a 440-hp version of Porsche’s twin-turbo 2.9-liter V6 and a 550 hp twin-turbo 4.0-liter V8, according to the report. We suspect it will also adopt the new Cayenne’s hybrid powertrain eventually.